Pato has had his fair share of critics this year, and I am not sure why. I have seen a steady growth all year long, as well as too many goals scored to ignore. These “ugly” critics want him to be a player that he is not. They want him to play their way, live up to their expectations. And maybe they have some valid points. But our not-so-little ducky exceeded my expectations today, in a game he made his own. Pato hit the ground running against Napoli, he made his presence known immediately. By the end of the first half, he had earned himself a yellow card for channeling his inner Gattuso and shoving Aaronica to the ground like a rag doll. While this was perhaps a little too much heart, it was still fun to watch him secure his place in the pecking order. But of course, it was on offense that he dazzled. Running, dribbling, passing, shooting, and yes, even taking corners and free kicks. He had a great goal: a great run, splitting two defenders and then beating De Sanctis, and then the assist for Boateng’s goal, too, but it seemed like the stars aligned today leaving him to shine the brightest. I hope those ugly critics see him for who he really is now. People are used to Ibrahimovic being the star of the show. But I think this discounts the flip side of him becoming more of a team player, that the team will be more important than him. Some think he is playing poorly, or that he “disappears.” But with 14 goals and 11 assists in the league, I hardly think that is the case. His confident penalty today was a significant contribution, and while there were times he looked less than impressive, he always stays in the game and makes plays that lead to greatness, even if only for his teammates. Allegri has also taken some criticism from fans, and certainly before the game, I myself questioned his lineup. However, today, he showed his brilliance as a tactician and a motivator. He chose the best team to play against Napoli, and they in turn, rose to the occasion. What I think he does best is to find a system, stick to it, but be flexible with the players he plugs into that system. Today, for example, his 3 defensive midfielders played as much offense as anyone else. Where many feared they would be static and prevent the ball from being linked forward, when our forwards were marked so heavily, our midfielders personally brought the ball forward, problem solved. Jankulovski played at left back, the most concerning spot on the field for Milan this year, and he rose to the occasion, silencing all doubters. And perhaps the biggest news of the season, he did NOT start Clarence Seedorf, nor did he get subbed in. While Seedorf is still a very talented player, many of us fans knew that his pace would kill us vs. Napoli, and Allegri apparently did, too. Allegri’s subs were perfectly planned and perfectly timed. Many wanted to see Cassano, but after Boateng came on and scored, I think that notion was forgotten. Playing Emanuelson for 20 minutes at left back was a great idea to give him some experience, and Jankulovski had exactly 70 minutes in him, it seemed. Oddo coming on for Abate in the 81st did not impact the game negatively, and besides, right back seems to be the spot Oddo does the least damage at. He’s earned a few minutes there when Abate needs to rest. Back to our original story, Milan’s offense dominated the game, with 17 shots, 6 on goal, including shots from Gattuso, Flamini and Jankulovski, it was a team effort. Milan’s defense was an impenetrable fortress, for a while it seemed that Abbiati could go grab some coffee, which is the way it should be. It should be a crime for your keeper to ever have to do any work. The first half was a bit of a stalemate, finally being broken in the 48th minute when Aaronica was called for a handball in the box and a penalty kick was awarded to Milan. 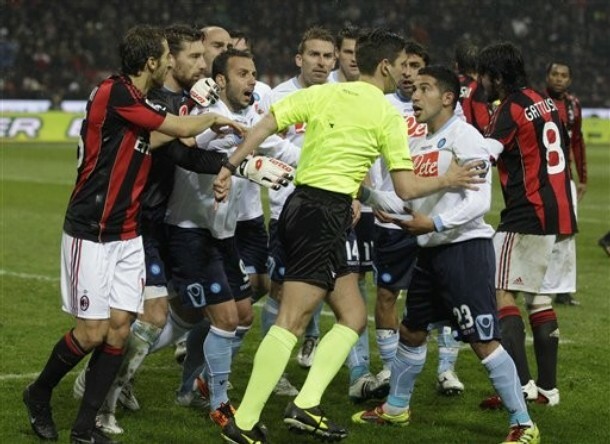 I loved watching Gattuso protect the ref when the Napoli players came appealing. 180 degrees from two weeks ago, when it was everyone else who needed protecting. As mentioned, Zlatan’s confident penalty poked a hole in the confidence of Napoli, and they deflated from there. With 7 shots, but 0 on goal, their infamous Matador and the rest of their snarling attack seemed to be reduced to cute little puppies. Napoli was on the ropes until about the 72nd minute, where they almost got themselves back into the game. Boateng’s goal in the 77th quickly reversed their fortunes, with Pato’s 79th minute goal sealing their fate. As for Napoli, they had a few stars that glimmered. DeSanctis is a keeper I’ve never been in love with, but he had quite the game tonight. Were it not for him, the scoreline would have looked a little more like that Udinese-Palermo one yesterday. It thought Campagnaro and Maggio played very well, and shut down our attack on many occasions, but in the end, Napoli did not have an 11 that were equal to Milan’s mighty 11 today. EDIT: A blatant omission on my part was Van Bommel's brilliant performance in this game. He rolled back the clock and came up big for us in the midfield, protecting our half like a noble knight. I nearly cried tears of joy when he came all the way forward and took that shot in the first half. If he is our "rental," consider us upgraded to the luxury vehicle for free. Worth his weight in Scudetto.